Cut in half 5 pieces of Roasted Chicken. You should end up with 4 pieces of white meat and 6 pieces of dark meat. Heat the skin on the 9 pieces on a griddle to make crisp. Heat and brown on the griddle 10 Vesuvio Potatoes (see recipe below) and 2 portions of Peppers/Onions (see recipe below). Add 8 oz. of the Appetizer Broth (see recipe below) and 1 oz. Lemon Butter (see recipe below) Heat 1/3 cup Peas in a pasta cooker and rain well. Stack chicken neatly on a platter with white meat on top. Pour sauce with peppers and onions over chicken. 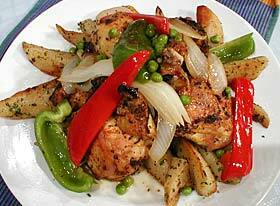 Arrange potatoes on and around chicken. Pour peas evenly over chicken. Garnish with lemon half. Preparation: Place butter in a mixer. Mix on medium speed for approximately 2 minutes until butter is light and fluffy. Slowly mix in the lemon juice and salt and pepper until thoroughly incorporated. Rough chop Garlic Cloves. Place the garlic cloves on a sheet tray in an even layer. Coat the garlic cloves with oil. Place in a preheated 350 degree oven. Stir the garlic occasionally to evening brown the cloves. Cook for approximately 25 minutes. Once the garlic is nicely caramelized remove from oven and let cool. Preparation for 4 potatoes: Portion the potatoes on a half sheet pan into a 450 degree oven for about 8 minutes until brown and crispy. Separate the potatoes in a pan. Pour sauce into the bottom of a bowl. Place potatoes neatly into the bowl. Stack perpendicular with length of the bowl. Garnish with 1/2 lemon. Preparation: Sweat garlic puree and oregano in house oil. Add flour to form roux. Add wine and bring to a boil. Reduce by half. Add chicken base, chicken stock, lemon juice, bay leaf, and thyme. Season with salt and pepper and simmer for 10 minutes skimming any fat that rises. Do not strain.